Discussion and examination take place at the initial consultation appointment when the patient reports time of onset, duration and intensity of pain in the affected area. 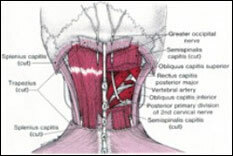 The examination explores the pattern of jaw movement to detect sounds and tenderness to gentle pressure. Patients are asked questions regarding possible TM dysfunction symptoms. If the patient answers "yes" to any of the symptoms and "yes" to clenching and bruxing, then further tests are required to confirm the presence of a jaw joint problem (TM disorder). Patients are checked for how wide they can open, slide left and right, move the jaw forward, and whether or not there is a deviation or deflection of the jaw upon opening. If there is a problem achieving normal range of motion, there is usually a structural problem within the joint. Excessive muscle contractions and trigger points indicate a problem with the chewing muscles of mastication. This causes the muscles of the head and neck to be sore when pressed by the dentist. This usually means that the lower jaw is not in the correct position. TMJ x-rays are important to see if the condyles (top of the lower jaw bone) are too far back where they would be impinging on the nerves and blood vessels at the back of the socket where the jaw bone fits into the skull. In cases where the lower jaw is too far back, dentists find a significant reduction in the signs and symptoms of TM disorders when the jaw is repositioned forward with a splint or a functional orthopedic appliance. This is specialized equipment used to take readings of the noises or vibrations occurring within the jaw joints upon opening and closing movements. 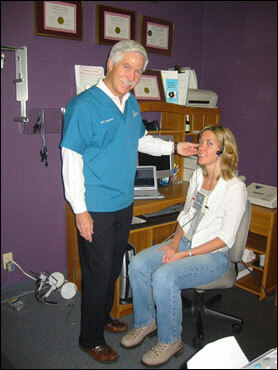 The JVA is simply a 3-minute, non-invasive test where headphones are placed on both jaw joints and the patient is instructed to open and close six times. An abnormal or dislocated joint has distinctive vibrations which can be analyzed to help diagnose the seriousness of the problem. There are basically 5 stages of disc displacement. Ideally, if there is a jaw problem you would hope that the patient is in Stage 1 or Stage 2 where the disc can be recaptured. If the JVA reveals that the patient is in Stage 3, 4 or 5, this is a much more serious problem and the prognosis is not as good for resolution of all the symptoms. Our office has the knowledge and experience needed for proper, thorough diagnosis and treatment of temporomandibular joint dysfunction. Since the teeth, jaw joints and muscles can all be involved, treatment for this condition varies. Typically, treatment will involve several phases. The first goal is to relieve the muscle spasm and pain as well as establish normal range of motion of the lower jaw. Then, your dentist must correct the way the teeth fit together. Often a temporary device known as an orthotic or splint is worn over the teeth until the bite is stabilized. Permanent correction may involve selective reshaping of the teeth, building crowns on the teeth, orthodontics or a permanent appliance to cover the teeth. If the jaw joint itself is damaged, it must be specifically treated. Although infrequent, surgery is sometimes required to correct a damaged joint. Ultimately, your dentist will stabilize your bite so that the teeth, muscles and joints all work together without strain. 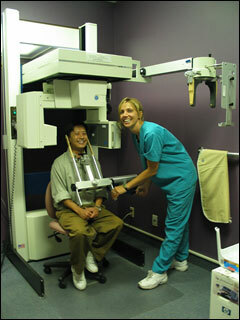 Once a thorough diagnosis has been made, the dentist will begin a personalized treatment program. Patients benefit from the non-surgical, conservative treatment our office provides. Individualized therapy will include muscle spasm reduction treatments in conjunction with an easy to wear, comfortable dental orthotic, referred to as a splint. The orthotic covers the lower teeth holding the jaw in proper alignment, reducing tension in the muscles of the jaw joint, allowing healing to take place. Once pain is controlled and the jaw joint is stabilized, the bite is balanced so the teeth, muscles and joints all work together in harmony. It is important to assess the posture of each patient to determine whether or not the shoulders, pelvis and hips are level. 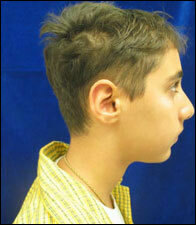 Photos are taken of each patient to check for the above as well as to check for forward head posture. If there is a problem with the shoulders, hips or pelvis or if one leg is longer than the other, then a referral to a chiropractor would be necessary. To solve the problem of forward head posture which can cause cervical (neck) problems, referral to a dentist or orthodontist who uses functional jaw orthopedic appliances should be made. These appliances such as the Twin Block, MARA or Herbst Appliance successfully reposition the lower jaw forward and eliminate the forward head posture. If there is an improper relationship between the upper and lower jaws and/or the upper and lower teeth, the patient will be required to wear temporary oral appliances (orthotic or splint). This TMJ splint is usually worn over the lower teeth until the bite and position of the lower jaw is stabilized. 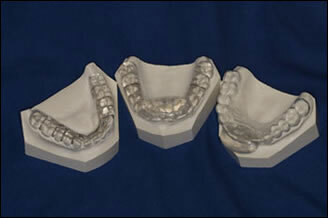 The objective of the lower splint is to try and establish the correct position of the mandible to the maxilla in three dimensions; namely, transverse, sagittal and vertical. The goal is to try and find a comfortable position for the lower jaw so that the patient can get some relief from the pain and muscle spasms. If the patient has a denture or a partial denture, the splint may be constructed over them similar to the method with natural teeth. Since most head, neck and shoulder pain originates from muscle instability or swelling and inflammation of the joints, we may employ various physical modalities to treat and help normalize these structures. This includes such things as transcutaneous electrical nerve stimulation (TENS), moist heat therapy, vapor coolant sprays, and infrared treatments. These joints often get very tight in people with dysfunctions and various types of mobilization or stretching techniques are employed to gain normal function of these tissues. Sometimes it will be necessary to refer patients to other health care practitioners to help relieve some of the muscle spasms including chiropractors, massage therapists, physical therapists, craniosacral therapists, etc. The patient must be made aware of the fact that, although the majority of patients do improve substantially, there are still a small number of patients whose treatment is not effective. The longer the disc is out of position anteriorly, the more the posterior ligaments get stretched and the more difficult it becomes for the posterior ligaments to reposition the disc to its correct position on the head of the condyle. Some of these patients may have suffered traumatic injuries such as a blow to the head or have been involved in a car accident, which caused a whiplash injury. If the posterior ligaments, which help position the disc between the condyle and the temporal bone, have become stretched or torn as a result of a serious injury, then the prognosis for successful treatment is diminished. Obviously, the sooner the patient can be treated, the higher the success rate. Near the end of Phase I, which usually lasts four months, the clinician and the patient will evaluate the success of the treatment. The patient will take the same diagnostic tests, clinical examinations, and fill out the appropriate TMJ progress report to see what improvement there is in the signs and symptoms of TM dysfunction. If the tests, including the Joint Vibration Analysis and the tomograms (TMJ x-rays), reveal that the condyle is related properly to the glenoid fossa of the temporal bone and the disc has been restored to its proper position, we would assume there would be a reduction of the signs and symptoms. A consultation appointment is held with the patient to discuss the success of Phase I and the various options for Phase II. The vast majority of symptoms must be resolved in Phase I Diagnostic Phase prior to the initiation of Phase II Treatment Phase. Following diagnostic splint therapy to solve the problem of dislocated jaw joints, most patients have a space between their back teeth. The jaw has been moved to a temporary position where it is pain free. If the patient moves the jaw back to the original pretreatment position, the pain will come back. Therefore, to obtain a more permanent solution, orthodontics is often the treatment of choice, placing braces on the teeth and using up and down elastics to allow the back teeth to touch so the patient will be able to chew properly and with no pain. This is a more permanent solution to jaw stabilization and TMJ health. This stage can last from 12 months to 18 months depending on the severity of the case. If the space between the back teeth is large (more than 3 mm. ), then this is often the treatment of choice. 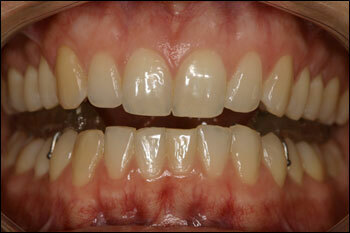 If the space between the back teeth is minimal (less than 3 mm.) or if the back teeth have large restorations or missing teeth, then the best option might be to close the spaces between the back teeth with crowns and bridges. If the patient has limited financial resources, often the treatment of choice would be the placement of an overlay partial denture over the lower back teeth in order to fill the spaces between the back teeth and to stabilize the jaw (TMJ). If the patient has an old denture or dentures with the teeth all worn down, new dentures could be made with longer back teeth to fill in the spaces between the back teeth. 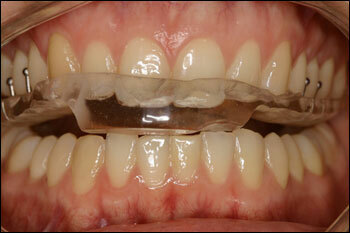 If the patient has missing back teeth, partial dentures could be made to fill in the spaces between the back teeth. The important aim of correcting your bite is to ensure optimal long-term health. If you have any of the signs or symptoms mentioned, discuss them with your dentist. Your health is your most priceless possession. It is worth the investment!